If you don’t like to smile, then the hospitality industry isn’t for you. Councial Glenn, left, discusses his new position in O. Henry Hotel’s sales administration with Dennis Quaintance of Quaintance-Weaver Restaurants and Hotels, which also owns, in Greensboro, Lucky 32, Green Valley Grill and soon-to-be-open Proximity Hotel. But if you have good manners, are friendly and like to make people happy, then the hospitality industry might very well be a good fit. Traditionally the hospitality industry refers to hotels and restaurants. It can also include casinos and other facets of tourism. The Department of Labor refers to it as accommodation and food services, a definitive moniker. The hospitality industry is all about being accommodating. 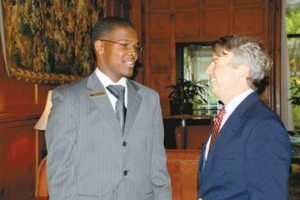 The secret of finding success in this business rings true in any occupation, says Dennis Quaintance of Quaintance-Weaver Restaurants and Hotels. “My dentist comes in and acts like he’s having fun. He digs it. He likes the way he does it. What is accomplished without enthusiasm?” Quaintance asks. He bends down to pick up a miniscule piece of paper dotting the patterned carpet of the O. Henry Hotel. That type of attitude is what drives a successful hospitality industry. No job is too small, no task too large. Attending to detail while saying “please, thank you” and “may I help you?” carries the job. “We can train everything but nice,” says Quaintance. And sincere niceness is what they look for in job candidates. This fall, Quaintance-Weaver is opening their latest endeavor, the Proximity Hotel and Printworks Bistro. The new hotel and restaurant will create 250 new jobs in an industry that is booming in the Triad. Al Romano, chef instructor at Guilford Technical Community College’s school of culinary arts and owner of Fire and Ice Custom Ice Sculptures, has worked in the hospitality industry for 25 years. “With my ice sculpture business, I deal with every hotel in the Triad. I see how business is going. It’s been an unbelievable change here in the past 20 years,” Romano says. On the Greensboro Convention and Visitors Bureau Web site, 81 different options for accommodations come up. More than 600 places to eat are listed. “If you have a degree or experience, you will always have a job. You’ll either love it or hate it because you have to like working nights and weekends when others aren’t. You have to know that quality counts in this business. It’s about immediate satisfaction,” he says. With Quaintance-Weaver’s need for new employees, the company hosted its own job fair last week at the O. Henry Hotel. The flyer stated that only those passionate about hospitality, food, wine, guest service, travel, design, state-of-the-art kitchens, nature, diversity and sustainable practices need apply. Entry-level positions in various departments are numerous while opportunity to grow with experience isn’t hard to find in the hospitality profession. Councial Glenn worked as a receptionist for the corporate office before transferring over to the O. Henry Hotel to work in sales administration. “I like being more involved in the daily business,” Glenn tells Quaintance. “This is the real work. The management company is here to support the staff,” Quaintance says, shifting to ask Glenn about his upcoming wedding plans and his fiancée’s well-being. In the grill room, Zahra Lohr is taking drink orders. She has returned from a jaunt to Europe and tells Quaintance that she hopes to make European adventures a habitual occurrence. Mark File, spokesperson for Quaintance-Weaver, explains that many hospitality jobs are excellent for students on break. As Quaintance-Weaver opens Proximity, they hope to achieve even greater diversity in their workforce. They have designed sales offices to be wheelchair-friendly. Their staff hails from all over the world. Dennis Quaintance says that they hire people from different backgrounds and all walks of life, just like the people they serve in their business. “We feel like that people who really care about their job, that it comes through in their work,” says Quaintance. That aura of caring is the most important ingredient for someone in the hospitality field. While education is necessary in upper-level management and for culinary positions, entry-level positions require very little education except on-the-job training. However, a sense of caring and compassion and a desire to help others cheerfully are traits impossible to learn in any classroom. As Quaintance says, people can receive instruction on everything but being nice. That is a job requirement that has to be intrinsic.